If you are looking for the tallest National Basketball Association (NBA) power forward players, your list will never be complete without mentioning Zach Collins. The Portland Blazers big man is an exceptionally talented player with great balling skills. Standing at a height of 7 feet has made him a formidable player both at the offensive and defensive position. Interestingly, Collins shares the same height with fellow NBA star Dirk Nowitzki. In addition to his great height, the baller is also very versatile. His good floor spacing and flashing mechanics show he is one of the NBA stars to look out for in the near future. Who Is Zach Collins, NBA Power Forward? 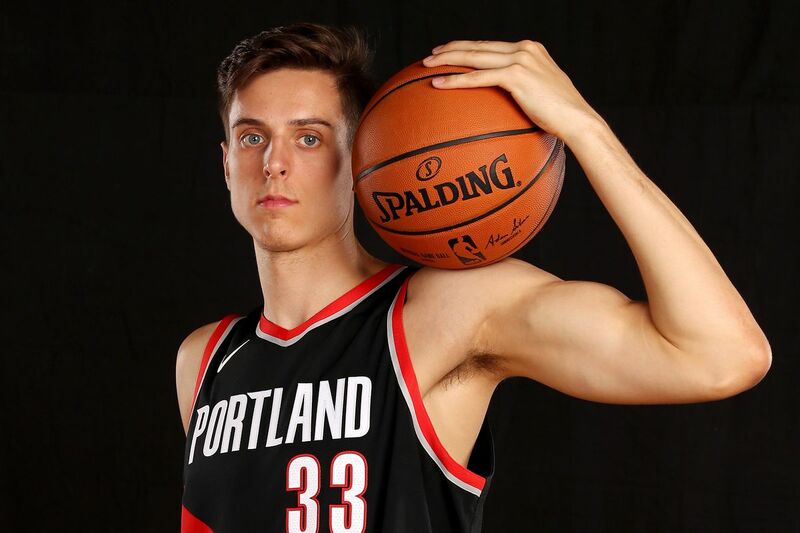 Zach Collins is a professional American basketball player who plays the position of a power forward/center for the Portland Blazers of the NBA. The player was first drafted off Gonzaga University by the Sacramento Kings during the NBA draft of 2017. He was the 10th overall player to be selected that year, however, he was later traded to the Portland Blazers. The power forward was born as Zach Collins in North Las Vegas, Nevada on 19th November 1997. His nationality is American while he is of white ethnic background. Zach started playing basketball when he was very young and pursued his dream of becoming a superstar from high school. He attended Bishop Gorman High School in Las Vegas, Nevada in the United States. There, he played high school basketball with the school team and led them to win four state championships from 2013 to 2016. During his high school career, he was among the tallest players in the court with others as Stephen Zimmerman, Bishop Gorman, and Chase Jeter who were fellow 7 footers. He notched an average of 14 rebounds and 17.3 points per game as a senior which earned him the Nevada Gatorade Player of the Year Award. Collins also broke the school’s record by having most rebounds and blocks in his senior year. He had an average of 6.4 blocks and 14 rebounds. At the end of his high school career, Jack Collins was regarded as a four-star college prospect by ESPN and Scout.com, five-star by Rivals.com and 247Sports respectively; while he was named to the 2016 All-American game. Zach also committed to the Gonzaga University for his college basketball career. Playing for the Gonzaga Bulldogs, Collins recorded an average of 5.9 rebounds and 10 points per game as a freshman in the 2016/17 season. He also led the Bulldogs to their first NCAA Division 1 tournament. At the end of his freshman season, Collins declared for the NBA draft while forgoing the remaining three years of his college eligibility. Zach Collins was invited to the NBA combine drill for the 2017 NBA draft. After putting up a wonderful performance, the player was projected as a first rounder. During the NBA draft of 2017, he got a spot with the Sacramento Kings with the tenth overall selection but was soon on his way to the Portland Blazers on a trade. Joining the Blazers, Zach Collins penned his rookie contract on July 3, 2017. At the end of his first professional season, he had played a total of 66 games for the Blazers while averaging 3.3 rebounds and 4.4 points per game. He also took part in the playoffs; thus, averaging 3.0 rebounds and 7 points per game. Collins was born to American parents Michael Collins and Heather Collins. His father, Michael, played basketball for the New Mexico State University before his career came to an end following a career-ending injury he sustained in his freshman year. Also, Zach Collins isn’t the only child of his parents, he has one sibling, a sister named Taylor Collins. Zach Collins has an amazing girlfriend Angelica Payne. Just like Collins, Payne is also from Las Vegas and she is currently a student at the University of California, Los Angeles. The duo began their relationship while in high school. Despite the distance between them; they both sacrifice a lot to be together. In their free time, they travel to places like Disneyland to cool off. In addition, Payne is a member of Alpha Phi sorority at UCLA. Zach Collins is really a talented power forward, he has a wonderful physique as well as great mobility and balling skills. Standing at a height of 7 feet with a wingspan of 7 feet 1 inch; the talented player also weighs 230 pounds – 104 kg. In addition, Collins has dark-brown hair and light brown eyes.